Looking for a way to revamp your regular beauty regime? Then we have the answer. 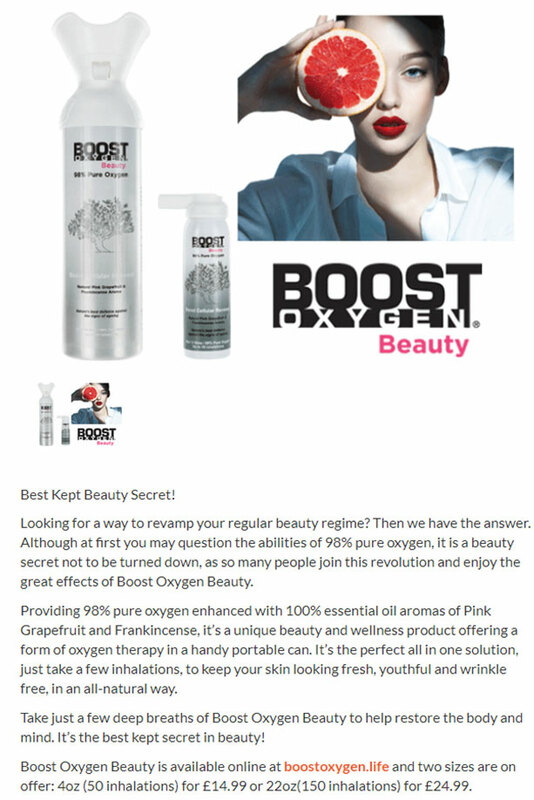 Although at first you may question the abilities of 98% pure oxygen, it is a beauty secret not to be turned down, as so many people join this revolution and enjoy the great effects of Boost Oxygen Beauty. Providing 98% pure oxygen, enhanced with 100% essential oil aromas or Pink Grapefruit and Frankincense, it's a unique beauty and wellness product offering a form of oxygen therapy in a handy portable can. It's the perfect all in one solution, just take a few inhalations, to keep your skin looking fresh, youthful and wrinkle free, in an all-natural way. Take just a few deep breaths of Boost Oxygen Beauty to help restore the body and mind. It's the best kept secret in beauty!